Omg! 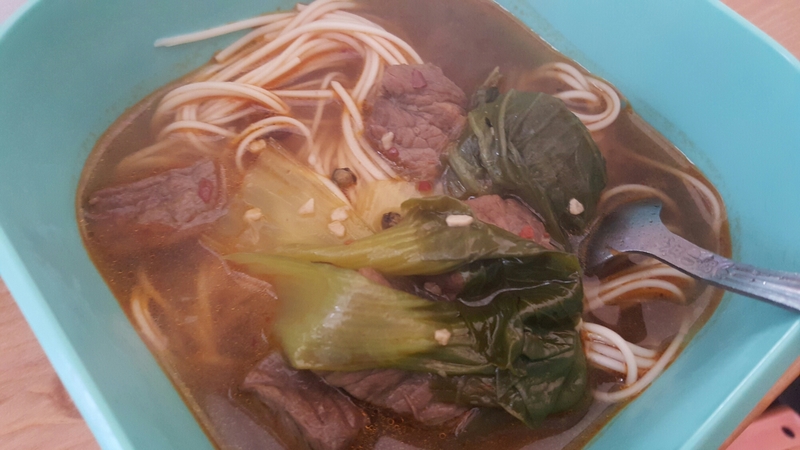 Just so proud of myself for finally cooking a decent bowl of Taiwanese beef noodles, one of my must-eats everytime I visit Taiwan. After 2 failed attempts, I finally got a pretty good taste, after managing to get the ingredients for it. I must say, it wasn’t hard! All I did was fry the garlic, ginger, spring onion, star anise,peppercorn together before adding in beef chucks, chili bean sauce and chinese rice wine. Which took about less than 15 minutes. Then I simply poured in water and let it simmer for hours, and there it is! A bowl of beef noodles! I did it last night and woke up to a savory pot of beef soup. I just added in noodles to boil for about 3 minutes today and got a hearty lunch. Definitely should try it again!